If you have been disappointed with Alfresco's web content management user interface, you should see what is happening in the Community Edition (2.9 - an R&D release). In particular, there is an extension called Alfresco Dynamic Website that seems to provide a much better UI for managing web projects. I have not started playing with it but it looks promising. 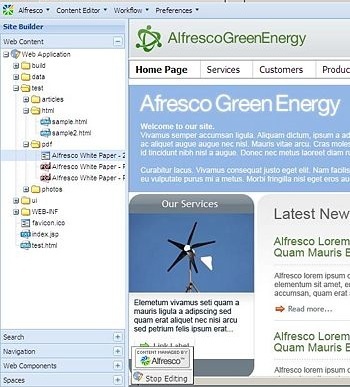 With this extension, Alfresco WCM gets a much needed tree control to browse and organize a website and in-context editing. BTW, how did Alfresco know to win me over by having an enviro-demo? I wonder if this work was somehow tied into their recent Synerge win. According to the forum, at least some of these concepts will start to be available for Community Edition 2.9 by mid April (although, since 2.2 Enterprise is late, I am not holding my breath). The feature will be baked into Community Edition 3.0 scheduled for late July. The 3.0 is aptly named "Project Slingshot" - I think that Alfresco could afford to shoot ahead in WCM usability.